St. Albans – Paul Philip Ruais, a resident of this area for the past 2 years, passed away peacefully Sunday, July 2nd, 2017, at his home surrounded by his loving family. He was born in Methuen, Massachusetts on August 10th, 1955, the son of the late Joseph Philippe and Doris (Ouellette) Ruais. Paul was 61 years old. On December 10th, 1988, he married Alice Hergenrother, who survives him. Paul graduated from Central Catholic High School in Lawrence, Massachusetts. He then entered the United States Air Force receiving his honorable discharge in June of 1978. He then entered University of Massachusetts Boston, where he received a Bachelor’s Degree of Science in Administration. 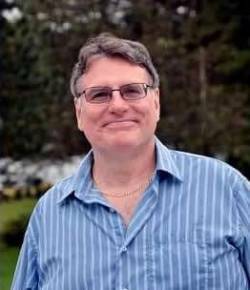 He had a long career and was integral part of the Information Technology Team at Boston University, where he retired as Data Base Administrator. He is survived by his wife, Alice, of St. Albans; their 2 daughters and spouses, Michelle Racine and Steve Davis, and Pamela and Nathan Willett, as well as his grandchildren, Sabrina and Christopher, Patrick, Alex, Zak, Sage and Zander and great-grandchildren, Colton, Shelby, Caidence, Cecelia and Carter. Paul is also survived by his brothers and their wives, Ronald and Michelle Ruais, Robert and Phyliss Ruais, Richard and Karen Ruais; his sisters and their husbands, Pauline and Donald Groele and Rita and Norman Beauchesne; his sister-in-law, Nancy Ruais and 16 nieces and nephews. In addition to his parents, Paul was preceded in death by his brother, Raymond Ruais. Paul’s family will receive family and friends on Saturday, July 8th, 2017, from 3:00 to 5:00 PM at the Heald Funeral Home, 87 South Main Street, St. Albans. A Mass of Christian Burial and interment will be held at a later date at Holy Rosary Parish and Cemetery in Hooksett, New Hampshire. To send a written expression of sympathy or share a memory, please go to Paul’s on-line guest book at www.healdfuneralhome.com.